At RHRLI, we’ve seen clients who deal with all types of hair loss and there are several types of hair loss related to autoimmune diseases. We want you to know all about the relationship between autoimmune conditions and hair loss. According to the U.S. National Library of Medicine, autoimmune diseases occur when your immune system, which is your body’s method of protecting you from disease, turns against itself and attacks healthy cells in your body. It’s not clear what causes any autoimmune diseases. There is evidence that they tend to run in families. And it’s also known that women, particularly African-American, Hispanic-American, and Native-American women, are more prone to getting them. There are more than 80 types of autoimmune diseases, which can make diagnosing them difficult at times. Some examples include rheumatoid arthritis, multiple sclerosis, Type 1 diabetes, inflammatory bowel disease, and psoriasis. As mentioned above, an autoimmune response is commonly associated with hair loss related to alopecia areata. Patients who have this condition see their body’s immune system attack their hair follicles. The patient’s hair follicles become very small and hair growth begins to stop. A major symptom of alopecia areata is patchy hair loss, according to the American Academy of Dermatology, which says patients often first notice the problem when they see clumps of hair on their pillow or in the shower. 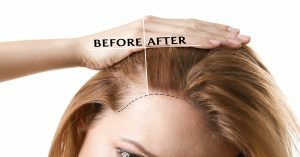 Alopecia areata can come on suddenly, usually on the scalp, but hair loss can occur around the facial area or any part of the body where hair grows. Some people only lose patches of hair, while others can lose all of their hair. The condition often is not permanent, and about 30 percent of those who have it continually lose and regrow hair. Some other autoimmune diseases can also lead to hair loss. Lupus, which affects many different systems of the body, is one of them. Symptoms include fatigue, headache, painful joints, anemia, abnormal blood clotting, and hair loss, according to the LiveStrong website. The disease is usually triggered by environmental factors like exposure to the sun. Hashimoto’s disease, which occurs when the immune system attacks the thyroid gland causing an underactive thyroid, can also result in hair loss. If you’re suffering from severe alopecia areata or any other condition involving permanent hair loss, RHRLI has the answer to your hair loss. We’re the only hair loss treatment center on Long Island that has the ARTAS® system, which uses state of the art robotic technology to give you a fuller, healthier head of hair. ARTAS® is a virtually pain-free procedure so you will be back to your normal routine very quickly. To learn more about the ARTAS® System or to schedule a consultation, contact us today.